Home born Israelis are called sabras for a good reason. Sabra is a nickname for the thorny desert plant, the prickly pear. Its thorns are sharp, and it has a thick skin that covers its sweet, softer interior. You have to be very careful with it or it can really stab you. A few days ago, an older Israeli came up to put on tefillin. He knew how to put them on by himself. I invited his Israeli friend to also put them on. His reaction was just like the outside of the prickly pear. I asked again, and the thorns got sharper. I let it rest for awhile, and then, stubborn as I am, I tried the third time. Whew! I hate to say it, but I really understood why they are named after the prickly pear. 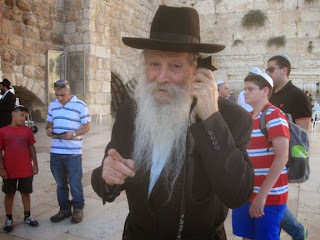 Finally, with him watching, I picked up the tefillin head piece, held it close to my ear as if I was talking on a cell phone, and said, "Hello, Okay". Then, I held it out toward him, and said; "It's for you." He cracked up laughing. He couldn't help himself. He came over and let me help him. He read the shema, prayed for the kidnapped teens, and for his family. From the look on his face he had a good time. He was not in a rush to take them off, either. Once you get past the thorns, the fruit is sweet.